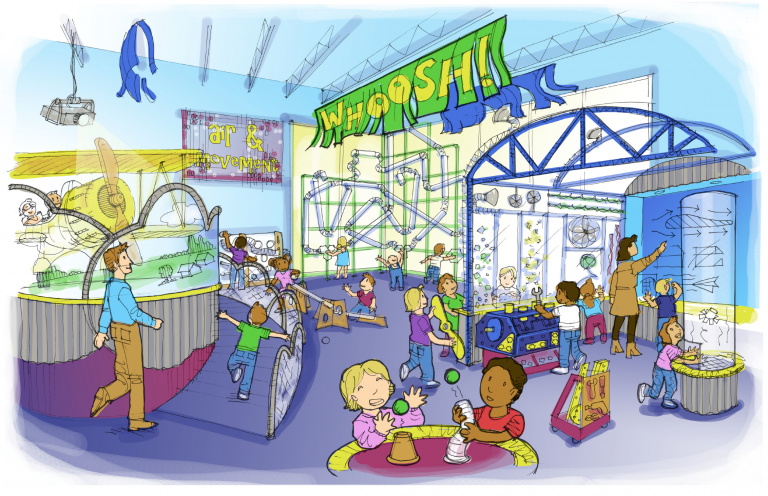 Check out the exhibits coming to the museum! Over the next few years, construction is scheduled to begin on new additions to the museum family! Make, Pack, Ship! Manufacturing. 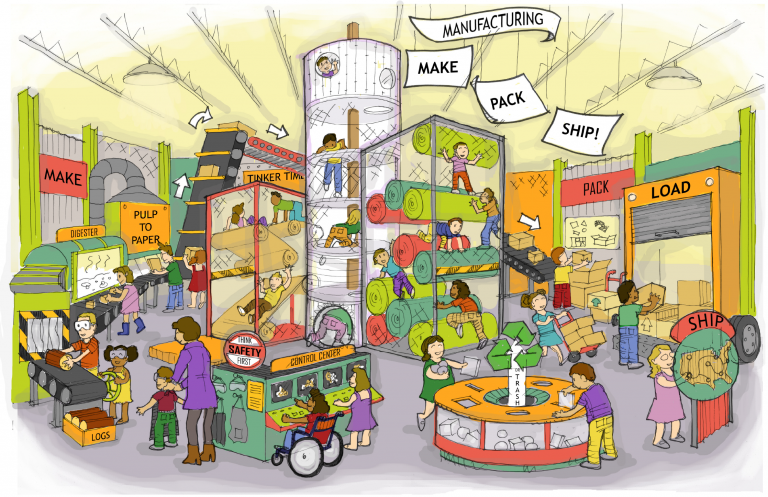 Come plan, build, and move as we discover the importance of manufacturing in our region. Learn the careers and products in paper, packaging, trucking, conveyors and more that keep the world moving. Just like Midwest Manufacturing, the gallery is located as the central hub of the museum. The Paper Roll Climber soars into the tall skylights of the architecture. Kids climb, scramble, slide and roll up and down enormous paper rolls to reach the Paper Tower. Zigzag to the top as you uncover facts. Take in the panoramic view of the museum from the summit. Back at ground level, get hands on with manufacturing. Gear up at the Safety First Station as we head to the factory floor. Check out Log to Pulp where raw lumber enters the first stage of the paper trail. Next comes Pulp to Paper as we work hard making everyday paper products. Teams of kids communicate and solve problems to transport items at the Move It conveyor system. Operate simple machines as our product snakes around the room. Be ready at the Pack It station as our product comes down the conveyor. Solve a fine motor puzzle fitting items in a box. Take our boxes to Load It to solve big gross motor challenges. How many boxes can we stack in the truck? Deliver our product from the Midwest to the world using trucks, trains, boats and planes at Ship It. Are you inspired to design your own product? Work with real materials and tools in Tinker Town to make your vision. Finish at Reuse It as we explore the relationship of recycling and environmental stewardship to modern day manufacturing. It’s all about air and movement. Explore aerodynamics, gravity and momentum with engaging hands on interactives. Walking over from the check in area, we see air in action as families direct air to whoosh the Whoosh sign. Experiment at the Wall of Fans as we cause objects to spin, sink or oat using air power. In the corner backlit by the building windows are the Wind Tubes. Children discover air pressure, ow and direction as they shoot colorful balls and scarves through the clear tubes, redirecting them to outputs around the room. Our littlest visitors practice their hand eye coordination as they try to predict where the balls and scarves will land. Caught it! Touch down! Now, let’s head over to the Hangar and explore drag, lift, turbulence and air resistance at a series of open ended build stations. Invent copters, whirligigs, parachutes, wind turbines and airplanes at the Vertical Air and Wind Tunnel Testers. Does your invention oat, y or crash? Crash, no problem. Go back to the work table and re-engineer adding ns, weights and struts to achieve the right balance and lift. Ready to jump in the cockpit? Head to the Green Bay Flyer to pilot a kid size Biplane. Crank the engine on and feel the rumble. Take off into the video projected clouds as you feel the wind ow through your hair. Bank to the left or right with the controls and watch the projection respond. Ready to land? Go experiment with momentum, velocity and gravity at the Discovery Ramps. Connect a series of planks, chutes and tubes as you deliver balls from point A to B through loops, drops and inclined planes. Come play in the water. Explore fluid dynamics and the water cycle as we sink, oat and boat our way through the Green Bay waterways using the world’s greatest loose material- Water! Approaching from the distance, we are drawn by the sound of water and laughter as we see the Leo Frigo Bridge arching over the Fox River Water Play Table. Natural light streams through the tall windows illuminating the translucent murals of the Green Bay shoreline. The Lighthouse Tower, a museum icon, beckons us to come climb the stairs for a bird’s eye view or dig in the sandy shores. 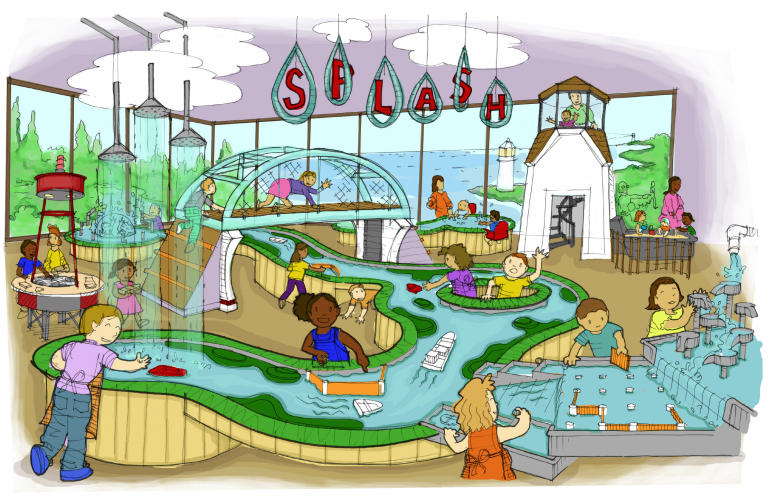 Let’s head to the Watertable and experiment with inventions to help divert, control and conserve water. We can use terraces, dams, locks and gates to control the ow, speed and direction of the water. Over at the Boatyard, design a ship using parts of different sizes, shapes and weights to see what oats best. Head to the river where rain clouds downpour. Launch your boat and see how it speeds up or slows down as it meanders past islands, sandbars, narrows and straits. What happens to the river if you widen a tight spot? Discover the principles of water pressure and plumbing mechanics at Build a Fountain. Connect real pipes to divert water where it is needed or create a beautiful water fountain. Head below the table to watch the fountains squirt water onto a see-through viewing dome. For our youngest visitors, the Toddler Pond offers a fun place to splash and discover. A series of built in baby seats allow children to safely play while parents free keep their hands free to join in the fun.